By Heather Ivy, D.O., Damon Brooks, D.O. A 74-year-old woman presented to her primary care physician complaining of worsening hand pain and stiffness. She had tried various nonsteroidal anti-inflammatory drugs, but her pain increased over time. The physician noticed hypertrophy, erythema, and tenderness of the interphalangeal joints on physical examination and ordered hand radiographs for further characterization. 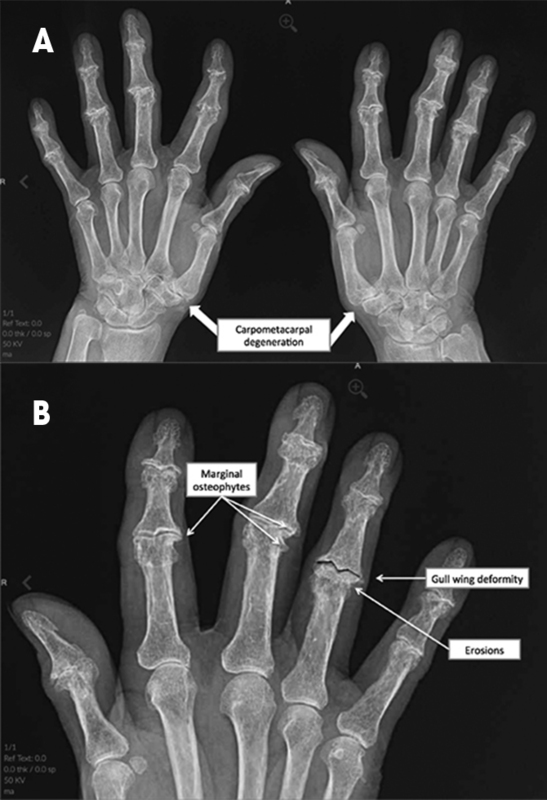 Frontal radiographs (A) revealed symmetric proximal and distal interphalangeal joint space narrowing, subchondral sclerosis, marginal osteophytes, and erosions. The erosions demonstrated the characteristic “gull-wing” appearance (B) of erosive osteoarthritis. She also had degenerative changes of the first carpometacarpal joints (A). Keats TE, Johnstone WH, O’Brien WM. Large joint destruction erosive osteoarthritis. Skeletal Radiol 1981;6(4):267-269. Chew FS. Radiology of the hands: review and self-assessment module. Am J Roentgenol 2005;184:S157-168. Ivy H, Brooks D. JAOCR at the Viewbox: Erosive Osteoarthritis. J Am Osteopath Coll Radiol. 2018;7(3):34. Heather Ivy, D.O., Damon Brooks, D.O. Dr. Ivy and Dr. Brooks work with the Department of Radiology, Oklahoma State University Medical Center, Tulsa, OK.